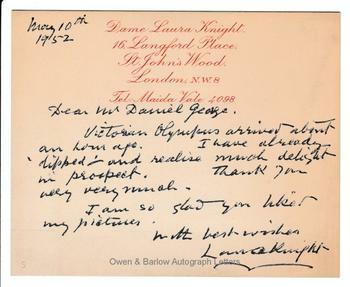 LAURA KNIGHT Autograph Letter Signed. Dame Laura Knight RA. English painter, etcher and engraver, noted for her depictions of circus, theatre and ballet. ALS on her printed correspondence card. 16 Langford Place, St John's Wood, London, NW8. May 10th 1952. To Daniel George. "Victorian Olympus arrived about an hour ago. I have already 'dipped' - and realise much delight in prospect. Thank you very, very much. I am so glad you liked my pictures. With best wishes, Laura Knight." The book referred to is William Gaunt's 'Victorian Olympus' which dealt with the influence of the classical world on English painters who had made the 'Grand Tour' of Europe in the 19th century. Daniel George was an editor at the publisher Jonathan Cape. He edited the books of AUGUSTUS JOHN and other artists but also had the distinction of being the first to read the manuscript of Ian Fleming's first James Bond novel, 'Casino Royale', which he then strongly recommended for publication.